We stepped outside our door in Marrakech yesterday morning, and after a nod to the mule on the left, looked straight ahead, down a narrow passage with high walls on either side. There a pair of men were working to paint or repair a set of massive, wooden doors. Curious, we thought we'd go over and look. The men smiled and beckoned us to come closer, then ushered us over to an unimposing open door at the end of the passageway. We could see more doors leaning against the walls inside, and I assumed they wanted to show us their workspace. We stepped inside. 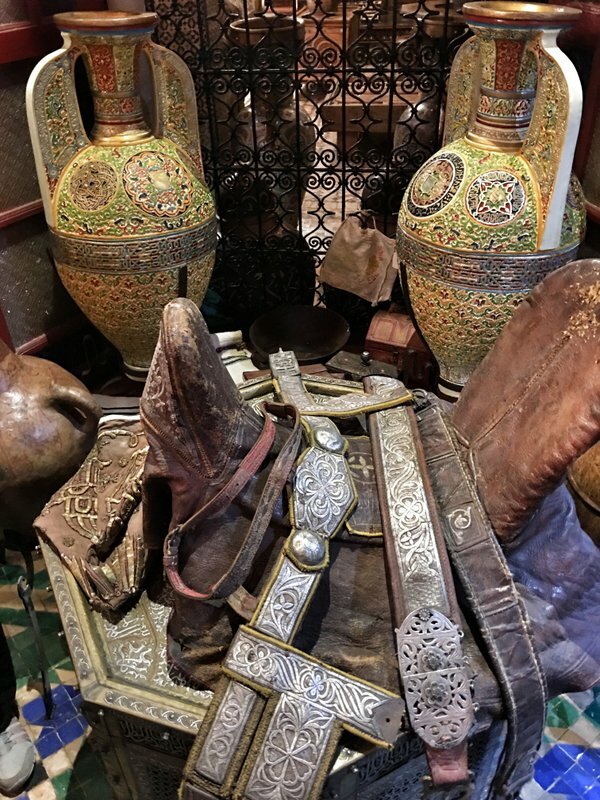 Instead of a workshop, we came out into a huge, open room that immediately brought to mind Ali Baba's cave, filled with treasure. 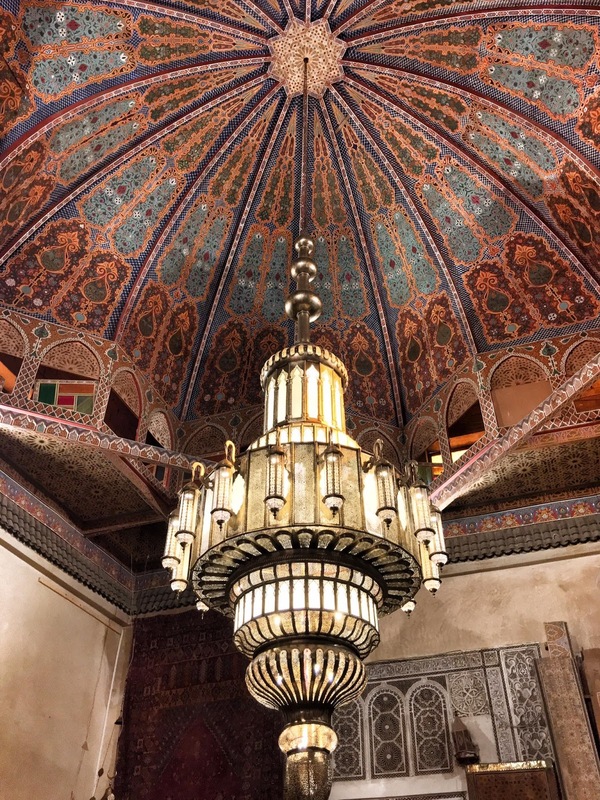 Part art gallery, part museum, hundreds of years of Moroccan artifacts and history are housed in this 16th century palatial riad. We were greeted warmly by Saeed, an American educated gentleman who had spent years working as a commodities trader in London. He is now helping to curate this amazing collection of antiques and art. Raphael was particularly fascinated with this compass. Saeed was happy to let him see it and show him how it works. He happily spent the next hour leading us from room to room, down passages that opened onto more rooms containing untold treasures in this riad turned gallery. He let us take pictures, which is not a given, and enthusiastically answered our many questions as we wandered, in awe of all we were seeing. It was like a private tour of an exclusive museum. This doesn't look like much, but the pieces leaning up against the wall are one of the elaborate carved and painted ceilings that is hundreds of years old. Saeed told us they been offered half a million dollars for this piece, but aren't interested in selling. They have plans to turn this riad into more of an official gallery and museum and have spent the last year building a restaurant. This ceiling will go into the restaurant. He told us many collectors from around the world come to shop. Not all of the collection is for sale, and he said he has to feel the piece is going to a good home or he won't sell. Apparently some collectors will buy up items similar to those they already own and destroy them to maintain the value on their rare pieces! Who knew? Saeed told us that if he doesn't like the feel he gets from someone, he will put them off when they ask about a price. I was particularly fascinated with the large collection of items from the Moroccan Jewish community that thrived here for centuries. Prior to the 1950s, it's estimated that there were around 300,000 Jews living here. Many of them settled here after fleeing the Spanish Inquisition, and they lived peacefully alongside the Muslim majority. In Marrakech there is a Jewish Quarter where the architecture is different. From what I understand, there are few if any Jews left in this city, but there are communities remaining in Fez and Rabat. This was a beautiful, silver menorah. 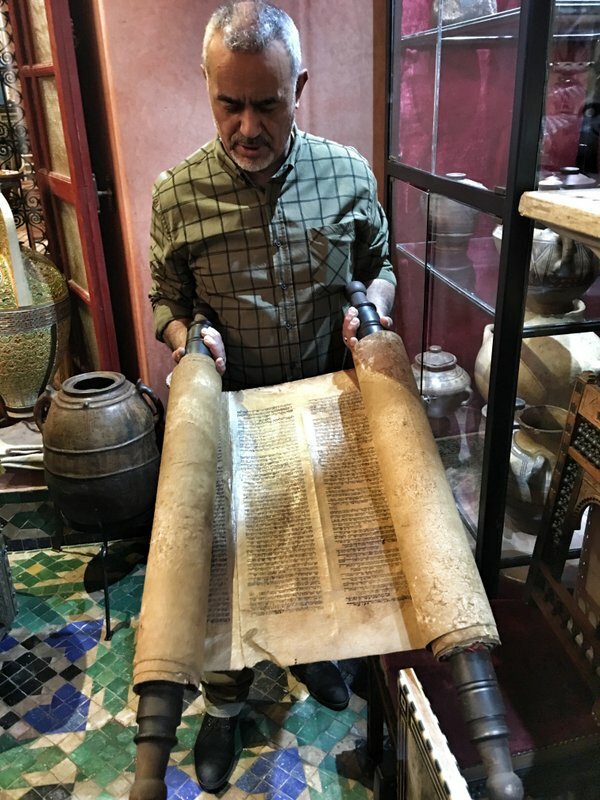 Saeed carefully opened this Torah scroll for us to look at. It's over 200 years old, and made of gazelle skin. I keep wondering how these treasures became lost to the Jewish community and ended up here! I imagine a lot was left behind when people left he country, but some of these are such special items! 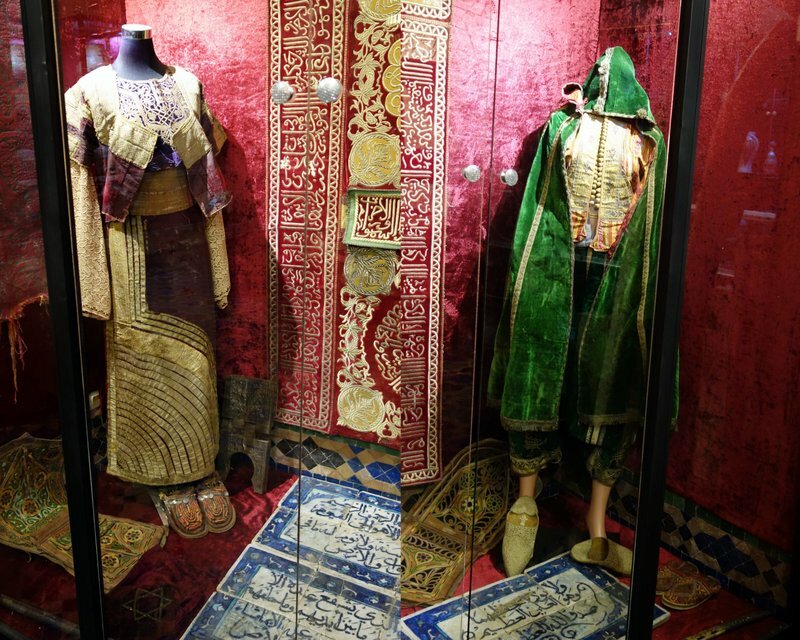 I don't know how old these are, but this is a set of Jewish wedding clothes! A beautifully embroidered Torah cover. This was in a glass case and not the best picture, but it is a large leather satchel that was a Rabbi's bag. The stitches are silver! This is another example of the amazing Jewish handwork. I believe Saeed said this was the belt that would be worn over a kaftan. He said the Jews are the finest craftsmen in the world! The stitches were beautiful and intricate. Finally, so that you can look stylish and be comfortable while riding your camel, we have an ornate camel saddle for you! And stirrups. Don't forget the stirrups. None of these pictures do justice to any of it, but I hope you can get a hint of the grandeur of it all! Over the doorway and hanging down on either side was a heavy, embroidered tapestry. Here is a close-up of the embroidery! Can you imagine? Oh yeah, the Romans were here at some point as well. The Pax Roman and all that. There are some Roman ruins somewhere around here. I could have stayed and asked questions and soaked in all of it for days. I couldn't figure out what these were, so of course I asked. The little pot is for ink, and the long part would hold the writing instrument. Saeed explained that the scribe would bring his tools of the trade along when writing up binding documents. Of course. I am still in awe, marveling at the wonders we stumbled upon. We thoroughly enjoyed our visit with Saeed. He was entirely welcoming to our whole family. I love the attitude toward children in this country! I can only imagine my stress in a similar situation in other places, but it was "no problem" to let the children look and even touch. I'm so thankful for these unexpected and wonderful blessings! I am speechless. For some reason this treasure of an experience given to you makes me want to cry.